In just about every kitchen in all of the 30 or so countries I’ve cooked in over the last decade — from Vietnam to Venezuela — I’ve found a well-used pressure cooker. For some reason, here in the U.S. we still have an irrational fear of this amazing tool. It’s true that they once were unpredictable. When I was a kid, my health-conscious mother used hers to make beans, soups, and stews, and on more than one occasion, I recall the top exploding and the steam valve shooting straight up and lodging in the ceiling. But they’ve gotten a lot safer since then. Still, most Americans have yet to discover just how versatile and dynamic a pressure cooker can be. 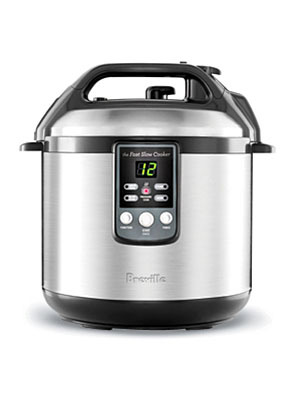 No appliance is better suited to a time-strapped cook who doesn’t want to sacrifice the flavor of a slow-cooked meal. As my mom knew, cooking in a hermetically sealed environment means beans that wouldn’t ordinarily be ready for hours will be lush and creamy in less than an hour. But the pressure cooker shouldn’t be relegated just to beans. It’s perfect for braising meats, stews, and soups. Anything you would normally cook on low heat in, say, a Dutch oven or slow cooker, can be done in a pressure cooker in a fraction of the time. Even better: The high-temperature steam extracts any flavors you add — from herbs to dried chilies, even a slice of bacon. Fixing beans in the pressure cooker doesn’t require soaking them overnight or watching as they simmer for hours on end. Just put the ingredients and cooking liquids — wine, stock, water, or a splash of apple cider — into the pot, cover, and lock the lid in place. (As a rule, use 2.5 times the liquid to dry the beans.) Cook over high heat until the pressure cooker begins to whistle, then lower the burner all the way down to a simmer for 45 minutes or so. I love to make white bean hummus. I overcook the beans, strain them, then puree with tahini, lemon, rosemary, a little garlic, and olive oil. Then I serve it with grilled flatbread. I use my pressure cooker more in the winter, when I crave heartier stews and braises. Rich, flavorful cuts like lamb shanks take several hours to braise, but I simply brown them in the bottom of the cooker, then add some vegetables and a dose of aromatics to concentrate the flavor. These include dried herbs and mild to medium chilies — even an anchovy to add depth of flavor. 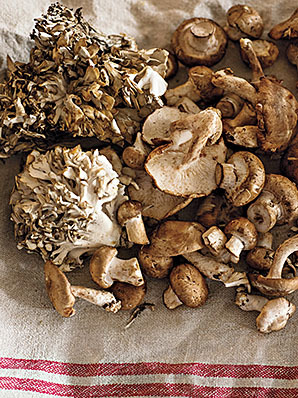 Add some red wine, stock, and mushrooms. Then simmer for 45 minutes and you’ll have a brilliant lamb-shank stew. There is probably no comfort food more universal than chicken soup. I use legs and thighs and season and sear them in the bottom of the cooker with some olive oil. Then I add root vegetables, sauté them quickly, deglaze with some white wine, add a generous amount of chicken stock, and close the lid and simmer. It takes about 10 minutes to braise the chicken, at which point I remove the lid, season with salt and pepper, stir in a little white miso, if I have it, then fold in some winter greens like mustard greens or kale.